One of the best vacation trips is to flee the Cleve in March for the warm Spring Training sun in Arizona. This was my third trip to Phoenix to watch the Tribe, raising my hopes for a winning year. My next few blog posts will be about my trip, but before I do that, I have had a few requests for a “How to” of sorts for Spring Training for Indians fans. Location, Location, Location. Did I say location? When you go out to Arizona, for Spring Training, you will need to make a decision right off. Are you only going to go to “home” games for Cleveland or are you going to follow the team around? 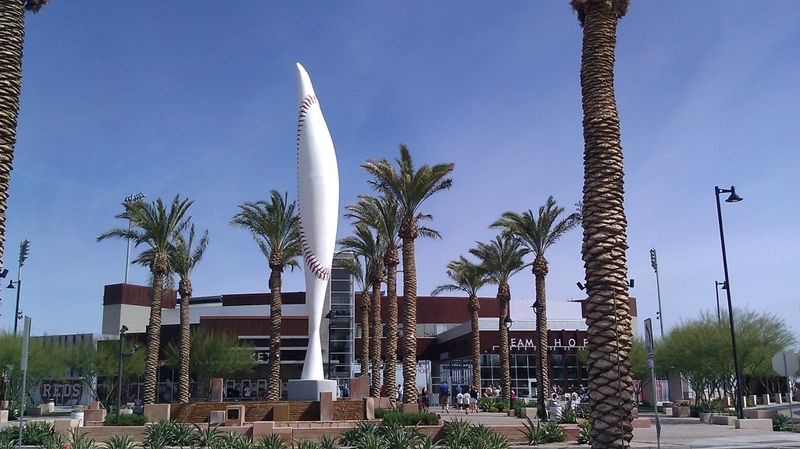 If you only are interested in home games, the team plays in Goodyear. 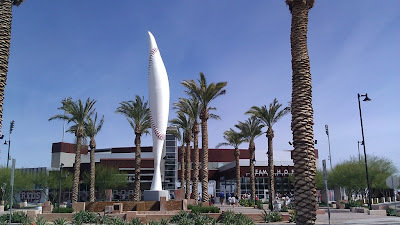 The thing is though, there isn’t a whole lot in Goodyear (although, each year they are adding more and more restaurants, hotels, etc.). I suggest following the team around and staying in Tempe or the Phoenix Airport area. Tempe is a vibrant city with oodles upon oodles of bars and restaurants. The Phoenix Airport area is a short drive (or cab ride) from the Tempe Mill Ave area. The hotels are nice and less expensive (I have been able to snag 3.5 star hotels for $50 or less a night) and incredibly convenient to the airport and major highways. I found the Tempe Visitors Bureau to be helpful in restaurant suggestions. Use them. Plan on renting a car, there is not any other way around it. If you check on a site like Priceline, you can get a car for $20 or so a day. From the Tempe area, you can hit most if not all the Spring Training facilities in an hour or less. Goodyear is about 45 minutes away. The interstates are easy to navigate, but I will warn you…don’t travel in the left lane unless you are ready to exit. It is weird, but the left lane tends to end at an exit only to have another lane added at the next exit (instead of merging), so be careful. Most hotels have little Spring Training booklets that will map out where all the teams play as well as the team schedules. In addition, there are newspaper zines all over town that include the schedules. Most teams practice at their home parks and it is open to the public. At Goodyear, if you pass the main park and turn down Lower Buckeye (heh), you will see Goodyear Ballpark on the left and the training fields for the Indians and Reds on the right. I *think* each team has 9 fields. For the Tribe, the first few are for the major players. If you go down further, there is the main office and then fields for the minor leaguers. Further down is the Reds complex. There is ample free parking on the road, so pull up and walk over to the fields. The Indians have stands for the fans (and a few picnic type tables) on *both* sides of one of the fields. You can find a secret spot to watch if you walk around the field to additional bleachers (and there is the only restroom over there…but beware. I think the ground crew only uses it). If you are lucky, there are balls that are hit over the fence and players will occasionally chuck one over to you. For the Indians, the actual batting practice starts around 10 am, but they are on the field as early as 8 am warming up. For the most part the players are friendly and happy to sign autographs. However, not every player every day. Keep in mind, these guys are at work. Imagine how you would feel people hounding you at your desk (ok, that would be kinda awesome). I have found if you are polite, players will sign if they can. As you walk up to the practice field, you will pass some bleachers and then if you walk a little further, there are a few tables (around home plate) and a fence. The fence is where people of all ages hang out hoping to get a signature. Please don’t be piggy. Let me repeat that. Don’t be piggy. Don’t try to get players to sign 10 different things. That irritates them and others in line. I assure you, if I don’t get an autograph because you are getting Grady to sign a bat, a jersey, 2 balls, a photo, a card and a program, I will thump you. Also, don’t be whiney and rude. Sometimes the guys simply can’t sign because they have to get to another field or work with a coach. Sometimes they sign before, sometimes after, sometimes at the game. What to sign? At the Team Shop, you can get a ball with the Spring Training logo on it for around 8 bucks (I did that) or you can hope someone tosses one to you, or whatever. I was told (after I got autographs, grrr) that if you are getting a ball signed, use a blue ballpoint pen. Yes, blue ballpoint pen, not a sharpie. I guess after 10 years or so the sharpie will fade and bleed. Who knew? Sharpies are good for bats and photos. And no, the guys don’t carry pens with them (one woman was barking because the guys didn’t have a pen for her). You can buy home Indians tickets from the Indians box office here in Cleveland or you can wait and buy them on site. In all the different parks, most are not sold out and tickets are easy to come by. Except…Cubs tickets. If you want to go to a Cubs game, anywhere, *especially* on a weekend, get them in advance. Cubs games are the only ones that I had seen scalpers at and the only ones that I have seen sold out. I found the staff at all of the parks to be incredibly friendly and helpful. Most will let you wander around to take pictures (even during the game) without any trouble. If you have a chance to go, I strongly suggest you do. Not only is the weather beautiful, but it is such a relaxing feeling, able to watch baseball in the warm sunshine in March.